Following the premiere, Sam Heughan was spotted arriving at the Build Series in New York on Monday(July 30th) to continue promoting 'The Spy Who Dumped Me'. 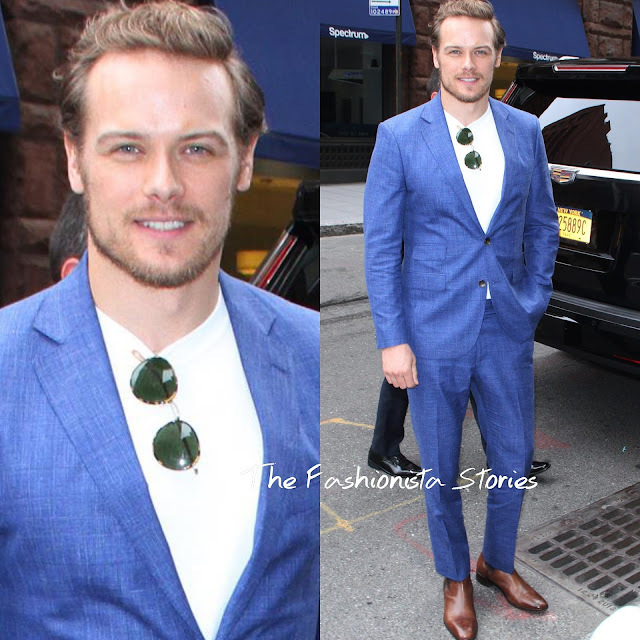 For his appearance, he wore the STRONG SUIT BY ILARIA URBINATI 'Kilgore' blue plaid two-piece suit which he teamed with a white tee-shirt and brown CHRISTIAN LOUBOUTIN shoes. I really like the fit of this suit more than his previous outing. Also the color looked great on him. The MONTBLANC '1858 Automatic' time piece finished up his look.